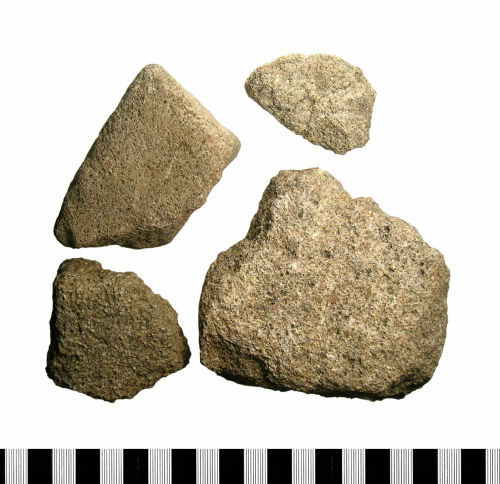 Four fragments of quernstone made from a light pinkish rough-grained stone - possibly millstone grit. It is uncertain whether or not the four pieces were all originally part of the same stone, but the thickness of the three intact, larger fragments is similar enough to suggest that they may have been. The largest piece measures 113.1mm long by 106.4mm wide and 52.1mm thick; its underside retains traces of what appears to be rows of carved circular depressions, which may have increased the effectiveness of the tool; the inner edge is slightly concave and appears to represent part of a central void. The second largest piece has a curved outer edge. It is likely that the pieces originated from a circular rotary quern, which, according to the chronology proposed by E.C.Curwen (1937; pp. 137-151), would date it to the late Iron Age or Roman period. The overall weight of the assemblage is 1481.5g.